Irish Santa ornament is a retired item that is limited to stock on hand. 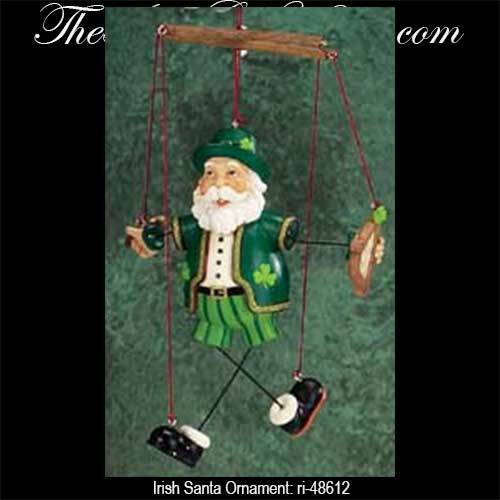 This Irish Santa ornament is a functional marionette with movable arms and legs on strings and he is enhanced with shamrocks. The Irish Christmas ornament measures a total of 8" tall and is made of colorful Polynesian along with metal and wood. The Irish Santa is holding a pipe in one hand and a harp in the other. The Irish ornament is ready to hang on your tree with the included cord and it is gift boxed with a shamrock gift card, complements of The Irish Gift House.